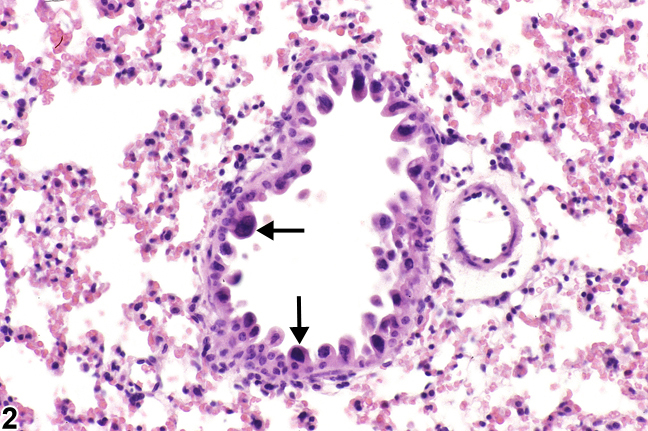 Lung, Bronchiole - Hyperplasia, Atypical in a female B6C3F1/N mouse from a subchronic study. The atypical cells have enlarged, hyperchromatic nuclei (arrows) and an increased nuclear to cytoplasmic ratio. Lung, Alveolar epithelium - Atypia, Cellular in a male B6C3F1/N mouse from a subchronic study. Atypical cells (arrows) have enlarged nuclei and may be binucleated. Lung, Alveolar epithelium - Atypia, Cellular in a male B6C3F1/N mouse from a chronic study. Several cells have enlarged nuclei (arrows). Lung, Alveolar epithelium - Atypia, Cellular in a male B6C3F1/N mouse from a chronic study. 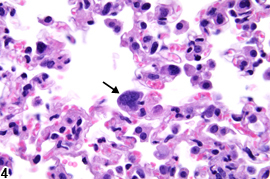 Some type II pneumocytes have enlarged nuclei (arrow). 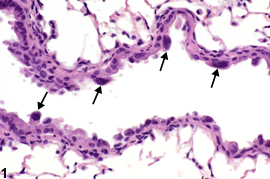 Atypia can be seen in the airways ( Figure 1 and Figure 2 ) or in the alveoli ( Figure 3 and Figure 4 ). 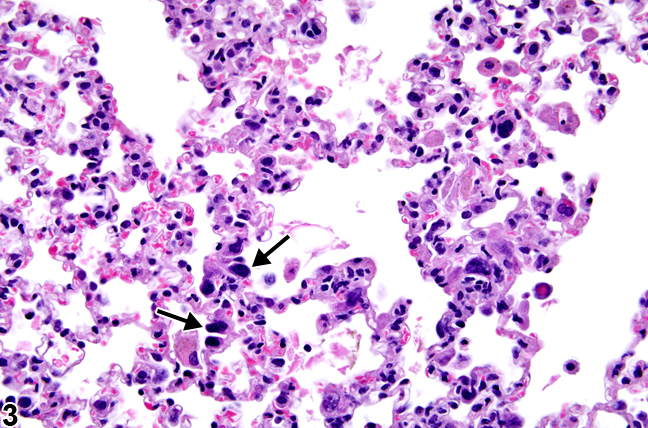 Cellular atypia in rodent lungs is characterized by one or more of the following features: cytoplasmic basophilia, hyperchromatic nuclei, loss of nuclear polarity, high nuclear to cytoplasmic ratio, karyomegaly, anisokaryosis, and pleomorphism. The atypical cells are often poorly differentiated and may be binucleated. They may have multiple and/or enlarged nucleoli. In the pathology literature, cellular atypia, atypical hyperplasia, and atypical adenomatous hyperplasia have been used synonymously with dysplasia to signify cells and nuclei with abnormal size, shape, organization, and/or tinctoral properties. While individual cells in the alveoli may have features of atypia, cellular atypia can also be seen in areas of bronchial, bronchiolar, or alveolar epithelial hyperplasia or squamous metaplasia. Some of the features listed above may also be seen in regenerating cells (e.g., cytomegaly, karyomegaly, cytoplasmic basophilia, increased nuclear to cytoplasmic ratio). The biological significance of this lesion is not known; in the absence of obvious regeneration, it may represent a preneoplastic change, particularly when associated with hyperplasia or squamous metaplasia. 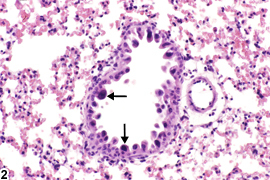 Lung - Atypia, Cellular should be diagnosed and assigned a severity grade. A site modifier (e.g., bronchiolar or alveolar epithelium) should be used to indicate which cells are affected. If more than one cell type is affected, the lesion should be diagnosed in all affected sites. If it occurs in areas of epithelial hyperplasia, the term "hyperplasia, atypical" should be used (see Lung, Epithelium, Alveolus - Hyperplasia). If it occurs in an area of squamous metaplasia, the term "metaplasia, squamous, atypical" should be used (see Lung - Metaplasia, Squamous). Since some features of atypia can be seen in regenerating cells, care must be taken not to overdiagnose this lesion. Associated lesions, such as inflammation, should be diagnosed separately. Knight JA, Rezuke WN, Gillies CG, Hopfer SM, Sunderman FW. 1988. 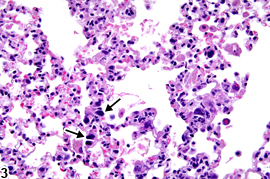 Pulmonary histopathology of rats following parenteral injections of nickel chloride. Toxicol Pathol 16:350-359. Solano-Lopez C, Zeidler-Erdely PC, Hubbs AF, Reynolds SH, Roberts JR, Taylor MD, Young SH, Castranova V, Antonini JM. 2006. Welding fume exposure and associated inflammatory and hyperplastic changes in the lungs of tumor susceptible a/j mice. Toxicol Pathol 34:364-372.